Getting up in the very early hours of the morning is often difficult, especially when your kids have woken you up four times in the middle of the night. You want to hit snooze on your alarm clock, and you want to hit snooze on life. The best experiences make you bounce out of bed no matter what time it is, because you know it’s going to be special. Such was the case at 5am one morning in Mackay, and despite her late night antics, I was relieved to see my daughter share my enthusiasm. We hopped in the car and drive 40 minutes north on a winding pastoral road to Cape Hillsborough Nature Tourist Park for one of the most special sunrises in the country. 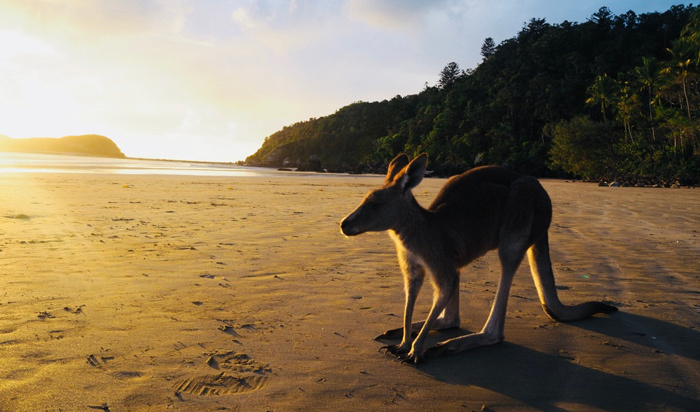 It all started over a decade ago, when kangaroos and wallabies showed up on a particularly beautiful beach just prior to the egg-yolk sun breaking on the horizon. 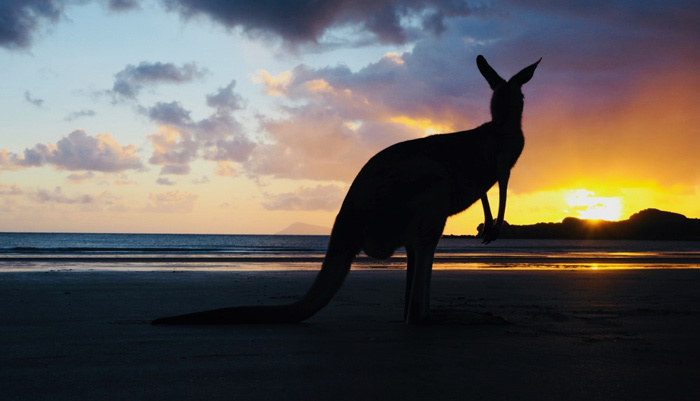 The park’s owners started feeding the roos, and about a dozen guests came to share the fun each morning in the glow of a quintessential Australian coastal sunrise. Then word got out. Qantas featured the experience in an in-flight safety video, travel writers like myself showed up, and next thing you know, hundreds of people are gathering on the beach each morning. All well and good, but not everyone has the good sense to let a roo do its thing. As with all wildlife, it’s important to keep a safe distance, and refrain from feeding sugary crap to animals that can become increasingly aggressive because of human interaction. Roos have been known to attack overzealous and idiotic tourists, as well as they should. Shortly after our sunrise in Cape Hillsborough, authorities and the park owners have decided it best to regulate the experience, charging a fee for live commentary from a guide about the region’s history and wildlife conservation. This morning however, my daughter and I walk along the gorgeous coastline towards a crowd of people gathered up ahead. The animals are already on the beach, and the sun is just about to make its splash. International tourists are obviously more taken with the sight of kangaroos and wallabies, but regardless of your experience with the marsupial, it makes for a very special wildlife encounter, in a very special place, and at a very special time of day. Memory cards are put to work as cameras big and small do their best to capture it. Clear orange light during sunrise makes for epic shots. It’s the so-called golden hour for photography that we rarely take advantage because it’s too damn early. My daughter is captivated, if a little chilly from the ocean breeze. It’s all over in about five to ten minutes, the animals scatter into the bush and the people towards their cars or more conveniently breakfast in their cabin, hut or motorhome inside the Nature Park. Nobody can deny that despite the time of the day, it’s a sunrise well worth getting up for.